What Can You Expect for Your Horse? Home > What Can You Expect for Your Horse? Navicular, Fractures, Osteitis - Typically expect to see improvements in the horses mobility within 3-6 weeks from starting and you should commit to 4-5 months on the program to successfully support rehabilitation. This will require two containers, whether you choose the powder or the pellets. For horses with degenerative bone issues, we recommend switching to a maintenance protocol (found under the "Feeding Instructions" tab) to maintain healthy bone conditions moving forward. Newly Discovered Issue - As degenerative issues typically progress and become worse over time, outgrowing remedial actions such as shoes, injections and pills, the sooner we can begin the program, the better. With that said, we've seen horses in their 20's that have had navicular symptoms for 20 years recover and do remarkably well. You should see improvements relatively quickly to be able to make your determination on if we're going to be successful (typically the first 3-6 weeks most horses begin to show improvements). Isolated Issue - If we can determine that the horse is only being effected by a single bone related issue, the less likely it is that other factors, like flexor tendon damage or chronic founder problems are affecting the horses ability to recovery properly and the better your chance for success. Calcium Deposits, Bone Spurs, Ringbone, Side Bone, Bone Chips - Typically expect to see improvements in the horses mobility within 3-6 weeks from starting and you should commit to 4-5 months on the program to successfully support rehabilitation. This will require two containers, whether you choose the powder or the pellets. Younger Horse - A younger horse helps us to ascertain that the calcium deposit hasn't been around for many, many years. The longer calcium deposits exist, the more dense and stubborn they become to dissolve back into the bloodstream. However, if you know your 22 year old horse has only become lame and developed a calcium deposit over the last 3 months, for example, then the age becomes a non-issue. Newly Discovered Issue - Along with the first bulleted point, the newer the calcium deposit, the less dense it is. So ideally we would have an issue only a few years old or more recent. Isolated Issue - If we can determine that the calcium deposit is the only thing effecting the horses ability to be sound, the less likely it is that other factors are affecting the horses ability to recovery properly and the better your chance for success. We typically recommend making dietary changes for horses with calcium deposit related issues. It is important to eliminate synthetic Vitamin D3 and outside sources of calcium from the diet to allow the program to work to it's potential. To do this TLC Animal Nutrition, Inc. suggests replacing commercial grains (purina, etc...) and any supplements containing significant amounts of Vitamin D3 & Calcium with our own feed ration found at the bottom of the page under "Feeding Suggestions" or Click Here. Replacing alfalfa hay with a grass hay will also help reduce calcium intake as well and give us better control over the catalyst in what's contributing to development of the calcium deposit. Taking these measures will give you the best chance of success with the EQUI-BONE program. TLC'S EQUI-BONE IS DIFFERENT FROM ANYTHING YOU'VE EVER TRIED BEFORE! Commercial "flex" products may provide joint support ingredients, like MSM, Glucosamine, Hyaluronic Acid, etc... but the elements included in those products focus only on supporting the tissue component of the joint. We focus on providing the optimal balance of nutrients required to support healthy bone development in one easy to feed formula. 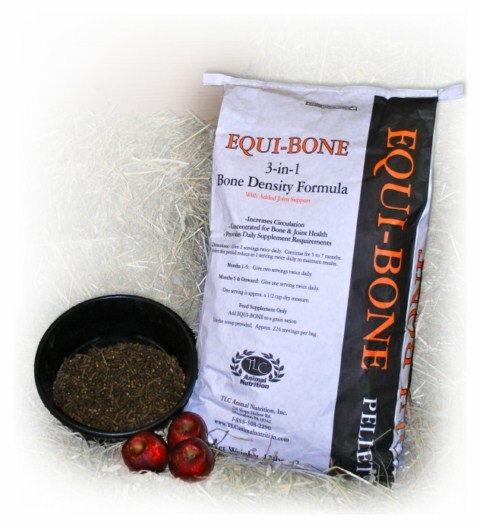 Our EQUI-BONE pellet will last one horse for 2 months at the loading rate. The pellet also features 1,750mg of each Glucosamine & MSM per scoop. The EQUI-BONE powder will last one horse for 2 1/2 months at the loading rate. The powder version does not contain additional Glucosamine or MSM.